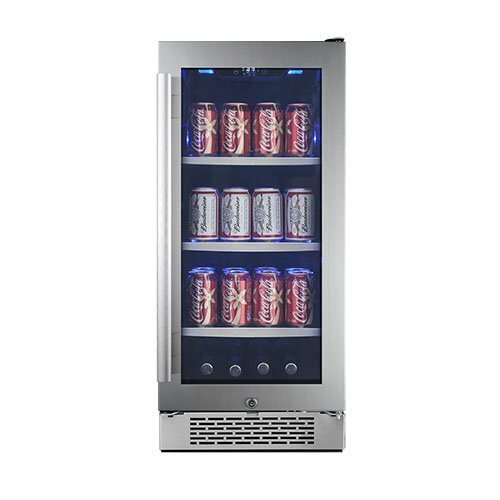 With a slim design, yet superior storage capacity, the Avallon 86 Can Built-InBeverage Cooler (ABR151SGRH) will seamlessly fit into any home environmentwhether it be a kitchen, living room, or personal bar. With a fan-forced frontexhaust, this unit works very efficiently as a built-in option. This gorgeousAvallon unit comes with a right hinged door. You'll never have to worry abouthot spots or uneven cooling with this unit due to its powerful circulationfans, which work with the compressor to evenly distribute cool air throughout.Able to reach temperatures as low as 34 degrees Fahrenheit, letting you getyour beverages as cold as possible without freezing. Alternate your lightingbetween a bright, white LED or a soft, blue LED - the choice is yours.Includes a true-key lock so you needn't worry about who's accessing yourcollection. Make sorting your collection a convenience by utilizing the threesanded glass shelves. The door is made from double-paned, Low-E glass, withArgon gas between the two panes in order to ensure maximum insulation. Inaddition to a durable, seamless stainless-steel door, the sturdy handle ismade from stainless steel as well. Can store as many as 86 standard sized sodaor beer cans. While this model is made for built-in installation, it can beused as a freestanding unit as well. Monitoring and adjusting the temperatureof this unit is simple thanks to the touch control panel. A top LED light bar,along with two LED lights on the right side and two on the left, provides softillumination.